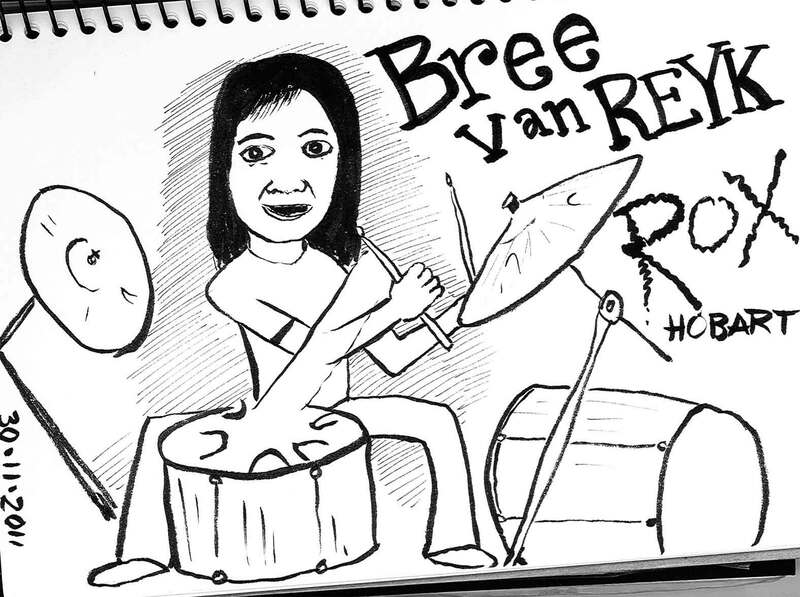 Bree Van Reyk used to play in a band called the Rebel Astronauts in Sydney which rocked! In fact – Darren Hanlon makes a reference to the Rebel Astronauts in one of his songs … I think it’s called an in-joke. Bree sometimes drums for Darren too, you see. Saw her play the other night in the St David’s Cathedral in Hobart with Seeker lover keeper. It was quite a top concert supported by Henry Wagons. She put me and Nadine on the guest list, very generously since it had sold out the church. When we arrived the lady at the door told to stand down the back near the wall and when they’d let everyone in we could find a small space somewhere and squeeze ourselves in … we dutifully went and sat on a cold hard bench behind the baptysmal font and waited. The lady then came back and apologised profusely for getting mixed up and took us to the very front and placed us there and said that she’d looked at the wrong list. She said we could go backstage if we wanted. Strange days … good seats. Thanks so much Bree. It was awesome!! Here’s something that Bree did a few years ago if you’re interested in percussive things.